What the hell are MGM playing at with their Stargate SG-1 DVDs? First they drop the commentary tracks from the episodes, saying that the usual participants are now too busy, now that they're producing two series. These commentaries - some of the most entertaining I've heard - virtually doubled the disc's value for money quotient, and helped a casual fan of the series like me to keep tabs on the series' increasingly complex back-story. MGM has now announced the specifications for Volume 40, and they've reduced the number of episodes on the disc from the usual four to three. They've done this before, when there's an odd number of episodes at the end of a season, for example, but there seems to be no good reason for it now. Where this has happened in the past, there's been some effort to compensate for the shortfall by increasing the amount of bonus content. But, as you'll discover, the bonus features on Volume 40 add up to about forty minutes, about two and a half hours less that there used to be on the season seven discs! Volume 40 features three episodes: Sacrifices, Endgame and Prometheus Unbound. Since both actresses are featured on the cover, it shouldn't spoil things to mention that the episodes feature guest appearances by Farscape's Claudia Black and the return of Star Trek - Enterprise's Jolene Blalock. The bonus featurettes on Volume 40 are The Supersoldier: Making of a Monster (15m) and two Beyond The Gate entries, A Convention Experience With Amanda Tapping (12m) and A Convention Experience with Michael Shanks (13m). 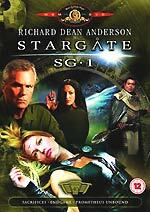 A thread discussing the new Stargate SG-1 discs can be found here, over at Roobarb's DVD Forum. Please feel free to add your thoughts! Fox has re-scheduled the release of the Tru Calling box set (announced last week) from the 9th of May to the 30th of May. The two Bergman Collection titles are Region 0, the others are all Region 2. Ceri has updated the Incoming page, which includes new details about a number of forthcoming titles, including a whole slew of new release dates for Tartan titles. There is also information about a few unannounced vintage BBC productions, including tentative release dates for forthcoming DD Video titles.